Celebrating Everyday Fathering, Every Day! 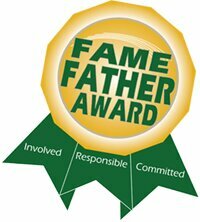 At Fame Fathers, we have a mission to improve the lives of children by increasing the proportion that grow up with "responsible, committed, and involved fathers." Our Celebrating Everyday Fathers, Every Day feature is our way of recognizing local fathers, grandfathers, uncles, mentors, and other male role models who are living out that mission. Hollywood often makes movies about fathers who triumph against all odds in order to have a relationship with their children, but we know it is the little, everyday things which ultimately build the foundation of a father-child relationship! We caught up with Ron at ACME Fresh Market while he was grocery shopping with his young daughter. Along with shopping, Ron and his daughter enjoy going to the library, visiting her great-grandparents, singing songs in the living room at home, and making up songs together. 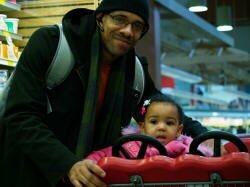 We asked Ron what fatherhood means to him and he shared this: "Fatherhood is being present. It's one thing to be in the room, but being present is being active so that they know you care." Ryan and his son were hanging out in downtown Akron when we met them. They were spending some time in the Lock 3 area looking around at the ice arena and Akron Aeros Stadium. Ryan told us that along with spending time together, he wanted to teach his son a little about Akron. Although it was a chilly day, we got to spend a bit of time with the father-son duo as Ryan shared his insights on the topic of fatherhood. When asked what fatherhood means to him, Ryan shared this: "Fatherhood is taking care of responsibilities, love, and determination to keep them from doing wrong while helping them to do right." 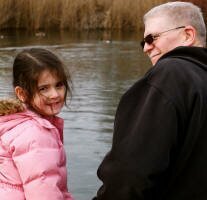 Chuck and his five-year-old granddaughter Juliana were spending time together feeding the geese at a local pond on a warm afternoon in late February. Chuck informed us that he and Juliana take a one mile walk every day while they learn about the nature surrounding them. Their recent endeavors have included finding deer tracks, learning about poison ivy, and feeding bread to the geese and swans. Without skipping a beat, Chuck shared this: "Being a grandfather is one of the greatest honors God could bestow." He also went on to say, "If I do not work with her, she will never learn these things!"